Great looking drawing. Love the site! Great Picture… I like the site. The Old Man is my favorite. they painted a shadow so what? and the second of all…its not a painting its a sketch!!! This is an awesome drawing! Someone really has some talent! The whole hat in monochrome WAS drawn!! Read the little blurp above the picture. I don’t get why everyone has to criticize and deny all the optical illusions. Just look at them and admire them–if they were’nt real, why would they be posted on a site? alien803, your so stupid. if they had drawn just the shadow, y wud they have put it on this fantastic website? dont u giv any credit to the person who drew this? i agree with Anonymous – it’s amazing!! holy crap! I thought that the drawing was a real hat!! I had to look a couple times to figure out that it wasn’t! to alien803, 7th comment…i’d like to see you do what that guy did. come on. show me. Holy crap! At first i thought the illusion would say “the differnce between new and old” and then i saw it was a drawing! p.s. the word verification is geting hard! Same as samantha, I thought they were two real hats. I was like what’s so optical about that. I wish i could draw that good i’m just going to look at his site, cn’t wait to see more of his pics if they’re as good as this one. Wow. This guy has some talent. His site is very cool, as are his flowers. The drawn hat looks so realistic, it has the look of fabric, and very convincing. If I was there, I might mistake it to be real. And there is no need to critisize, just look and be off with you or appreciate it, eh? And it says ‘Pepper’ not ‘Peppor.’ How could you think it was fake? OMG! I didn’t know what was so great about the pic but when i looked close i saw that the grey hat was actually a drawing! amazing! Brilliant! love this site and love this pic! All of you guys who are critisizing this guys drawings, I agree with jumjum – if you think it’s lame, you try drawing something so realistic that people can’t tell the difference! When I first laid eyes on this pic, I only saw two hats, nothing special. But after reading the top paragraph, I was impressed that the grey one was a drawing. After reading the comments, I think that the drawed hat kinda has a big flap, while the red hat has a much smaller one. hmm when i clicked this picture, i actually thought it was two hats… cool.. cool.. 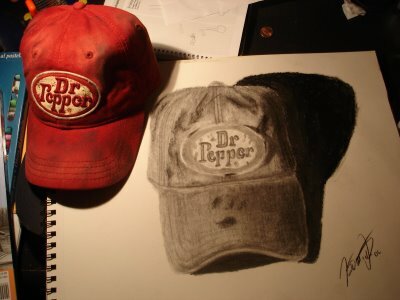 I think the guy who drew it did a really great job, specially the effect of dirt on the hat, more than the hat and shadow themselves. I actually recognised it as a drawing at first look, but it’s just cus I’m studying art. This is a really awsome drawing!!!!!! This is clearly an amazing work of art, you children take granit of how much time and effort went into this drawing. I thought the drawing was a real hat! Best I saw so far… at first I thought it was a real hat spray painted! I was looking for the illusion, and then.. WOW!!!!!!!!!!!!!! when I came to this page, I saw 2 hats, nothing very special. Amazing drawing! When I first saw this,I thought ‘is this supposed to be a new hat next to an old hat?’ before realizing that the black and white one’s a drawing! It’s AWESOME!!!! I loooooove art illusions!!!! Hahaha – at first i was like “and… 2 caps?” but then i realized the black/white one was drawn :P thats amazin! I actually thought it was 2 hats & didn’t get what the illusion was till I read the texts & then I was like OMG that’s a drawing! Amazing!! if you look on the drawn hat twice you see its just a standart pencil-drawing like we used to do in school. what makes it a illusion is the strong shadow and the light on the table that fits it. without the light and the real hat the painiting whould just look lame and the shadow whould be too dark. Well,you know its good when they know the shadow is fake but still think the hat is real.